We will help educationally disadvantaged children and youth reach jobs and careers by expanding the number of extra adults who become personally involved in their lives through organized, on-going, mentor-rich, non-school tutor, mentor and learning centers. 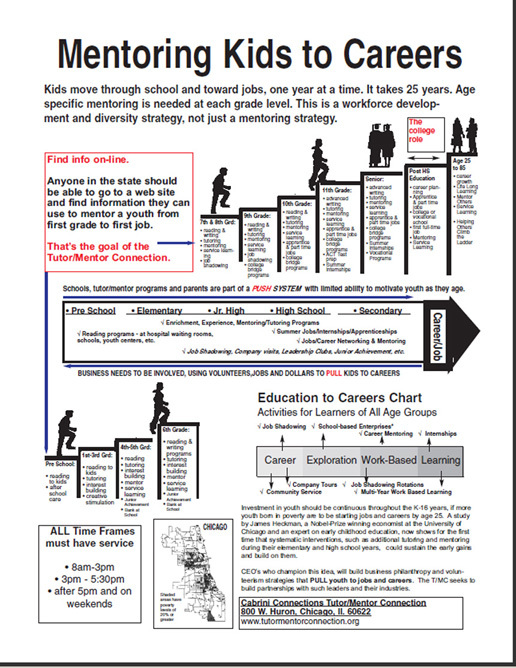 As a result of our actions, thousands of educationally disadvantaged children in major cities like Chicago will participate and benefit from comprehensive, mentor-rich programs that stimulate children's' desire to learn, increase their self-esteem, and reinforce classroom teaching through lessons and friendships with adult role models. Such program will mentor adults into greater involvement while mentoring youth, thus creating a mentoring-to-careers network of adults who will open doors to scholarships, jobs and careers as youth become young adults. See also Mission and Strategy. To achieve this vision leaders from many business, professional, entertainment, media and other sectors must make their own commitment to the vision and strategy. View this "leadership strategy" map. Consider showing your commitment by putting a version of this on your company web site.